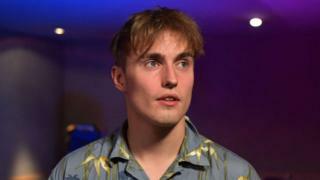 We meet Sam Fender at Polydor Records in central London. He's about to do a suit-fitting for the 2019 Brit Awards, which will take place the following night and where he'll be crowned Critics' Choice winner. It doesn't feel like his natural habitat. "No it's not, but this is what I want," he says. "I'd be complaining if I was at my mum's gaff in [North] Shields going, 'When's all this music stuff going to start working?'" And with the release date for his debut album Hypersonic Missiles just announced - it's out on 9 August - Sam's "music stuff" has more than started working. The 25-year-old's Brit win was followed by a North American tour, which included appearances on Jimmy Kimmel and a meeting with one of his Tyneside heroes, Sting. "It's not sinking in but I don't think this sort of stuff should, there'd be something wrong with you if it did," he smirks. "I'm quite happy being the rabbit in headlights... It's quite nice being the kid with the weird accent - like the Ant and Dec of the indie world." With a new tour about to begin, his hectic 12 months might be a far-cry from his native North Shields - but Sam's gone the extra mile to ensure his music is a homage to his hometown. "I don't live in London. I live in the place that I sing about. "I didn't even notice stuff was taking off until I went to Newcastle for a mate's leaving-do and I had a load of kids asking for photos. "That was surreal because in North Shields they knew me anyway so everybody's just like, 'Oh it's Sam, who cares?'" It's there, in the same town as the pub where he was discovered by his manager, where Sam built a studio with his best mates to record the album. "It was all made in North Shields and I'm really proud of that. "It sounds big, cheesy and like the 80s. I've got saxophone on three tracks - it's pounding. "I'm really proud of it. And utterly terrified." This is the first hint that Sam's success is playing on his mind, but he's insistent he won't let it get to him. "I put enough pressure on myself already - I can sit here and work myself into an anxiety-filled breakdown without worrying what everyone else is going to think. "If people like it, great, if they don't - well it's fine because I'm not going anywhere. "My manager in the pub always called us 'stupid boy' because I was the worst barman to ever grace their doors. "I'll always just be stupid boy and I'm happy with that." Some of Sam's recent singles, like Play God and Dead Boys, have pretty heavy messages in them but he says the album is "purely about what I'm seeing at the time". "I try my best not to be preachy... So yeah I've got tunes about male suicide and serious things like that but then there are tunes about one-night stands, bad weekends and just being an idiot. "I've got a song called Saturday on there which is genuinely about living for the weekend, which a lot of the country does. "Music's primarily there to entertain people... I'm not on any sort of crusade with mine but I do think there's a lot to talk about at the moment. "I'll dip into certain things because I find them interesting, not because I feel a necessity to change the world. I'm not clever enough to do that."